Gromit and friends in the Gravel Gardens. Absolutely gorgeous TT. would make a lovely stamp. Going to favourites. Truffle is rather a fidget ... Lol. This is a wonderful photo, well done on getting them to pose so well ! Glad to see Gromit back from his travels, and looks like your doggies are pretty please too! Smashing pic of your two Tt....Truffle really has grown hasn't he! Truffle looks like a coiled spring because he is like a coiled spring..Lol. He jumps all over the place, building up his leg muscles.. Recently we went to a charity dog show and Truffle won two trophies... both were first prizes in the Best Condition classes, in separate sections of the show, under different judges... he is so fit, he tires me out ! Lol. Thanks for letting us know and hi to you boys, nice to see you as always. That photo has my stamp of approval too, TT, it's lovely. Can't get over your beautiful lawn, I could bowl on that :) Since I've had Millie my lawn is more mud than grass - it looks much better now all the leaves are falling on it! Millie sends love to Conker and Truffle (she is a bit of a floosie!). My lawn does have quite a lot of clover, but I guess that's better than mud or bigger weeds..Lol. Crocus celebrated his 6th birthday yesterday . ..
cheep, tweet, tweet, millet, tweet, cheep, cheep..
Congratulations to you and Truffle, he certainly looks in great condition Tt. Perhaps feed less beans lol? The babies are looking so cute! Great gravel garden too! ... on the £1.46 stamp !!! ... my friends will be receiving birthday cards in July and August with stamps of Wallace and Gromit carol singing....lol..
You for forgot to add very, very HOT California. lol! It was almost 100F/38C. here yesterday. It's unbelievable! Yes, it is. It's already 100F./38C. today in some cities in San Diego County already...and it's only 11:00 a.m. I hope it cools down soon! I'll try to send some of those breezes in your direction...lol. "Keepers" of the garden! 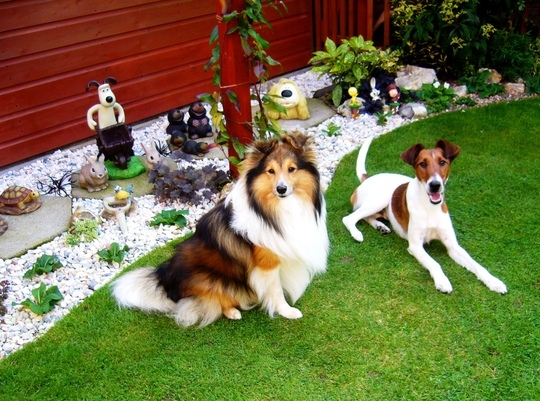 Nice garden; cute dogs! It's nice to see Conker looking so well! Hi Bornagain... yes, I saw the Wallace and Gromit Cracking Inventions.... the beach creatures were weird, weren't they ! Conker and Truffle, so dapper and well groomed. I love your gravel border with the Wallace and Gromit theme. I wish I could keep my patch as tidy Terra. I'm lucky that this part of the garden doesn't get too many fallen leaves, so easier to keep tidy, except that it is very shady, so I have to choose plants carefully. I think there should be Conker and Truffle postage stamps too, they would nicely decorate a christmas card envelope. Fabulous photo TT, and of course the two stars of the show look extremely handsome. What lovely, clean dogs! I am amazed at how pristine they look! I have a muddy pointer who is always rolling in objectionable things. Thank you for sharing this photo. Thanks, Lincslass ... I read some of your comments where you mentioned the GoY Gremlins .. must be very frustrating for you !